Director Noah Harris puts new Suzuki models to the ultimate fun safety test in a fairground dodgems arena. Suzuki releases ‘Dodgems’ spot to showcase the safety features of its latest range of vehicles. 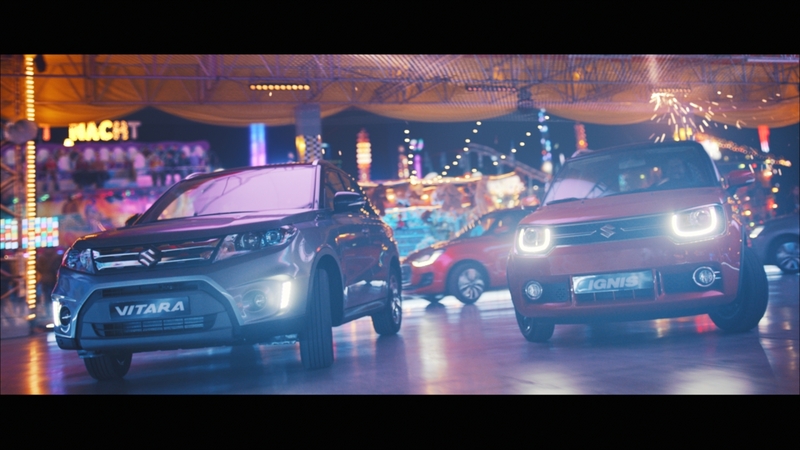 Part of the ‘Enjoy the Ride’, campaign created by Red Brick Road, the 60” spot, directed by Blinkink’s Noah Harris, is based in a night-lit fairground and sees the hero range of Suzuki models (the Ignis, new Swift and Vitara) playfully showing off their many safety features in amongst the flashing lights of the dodgems arena. Skilfully swerving one another, the special features of each car are what prevent them from bumping into each other. One model spectacularly spins in doughnuts as another swiftly halts to a stop just inches from a concrete bumper. The speedy automotive action is set against a backdrop of a bustling funfair, spinning rides and bright flashing lights. The Suzuki vehicles were shot on a purpose-built dodgems course in-studio with 10 stunt drivers, whilst footage of the busy funfair was captured in an exterior set. Post-production studio nineteentwenty were tasked with merging the footage of the two locations and adding the final flashing touches to the fair background and the sparking dodgems arena. In addition to enhancing the background shots, nineteentwenty also added some final 2D and 3D touches to the arena itself. The week-long shoot involved 10 stunt drivers and a set-built dodgems arena, bringing to life the infectious fun of the fair, via unique, graceful stunt driving. Suzuki UK will be running a 60" along with 30” and 10” cut-downs. Boosted by Sonz of a Loop De Loop Era’s “Far Out”, the TVC is a shot of energy and nostalgia that will resonate with consumers. The ‘Enjoy the Ride’ campaign will be deployed through-the-line, with Red Brick Road creating digital display, social, print, CRM and Point of Sale. In the UK and Ireland, communications will also highlight Suzuki's striking financial service offers.